Well, the weekend started off great. My husband took the day off, and we made the short trek over to the State Fair on Friday. The weather was absolutely gorgeous, and we had a wonderful time as a family. I’ve joked since then that if you ask my 2-year-old daughter what we did at the fair, she’ll tell you that “we saw trucks.” Not animals, not the ferris wheel, not the carousel. Trucks. And cars. She and my husband had a ball spending close to 45 minutes running around the auto show trying out different vehicles. I had to tear them away to go see the animals before we headed home. That evening we hosted a baby shower for some dear friends of ours in our Community Group. The next day consisted of running errands and preparing for a Southern Living party I was hosting that evening. About forty-five minutes before the party was to start, I popped the baguette I made into a 450 degree oven. Following the directions, I sprayed down the inside of the oven with some water to create the steam needed to cook the bread. This being my first time making a baguette from scratch, I made sure to follow the directions explicitly (normally I see recipes as “guidelines.”) The recipe instructed me to spray water two more times during the first five minutes of cooking. (Yea, you see where this is headed, don’t you?). As I closed the oven door after the second spray, I heard the sound of glass. Cracking. To my horror, I then saw little tendrils spread out, popping and hissing across the inside pane of my oven door. I didn’t dare open the door yet because I fully intended to finish cooking that baguette (if it was the last thing my oven would do!) for the final fifteen minutes it required. When the timer went off, I carefully opened the door and pulled the giant breadstick of doom out. I wasn’t quite sure what to do next, but I knew I couldn’t leave the door open. My friend Melissa, who had arrived early to help the consultant set up, assisted me in oh-so-carefully closing the door. Distressed because I had two dips left to cook, I called my neighbor. No answer. I called my close friend Angela who lives around the corner, and thankfully, she let me use her half-working oven. Ugh! The rest of the party went off without a hitch. The highlight, of course, was when we sat listening to the presentation, and the oven, having finally completely cooled, gave one last hurrah as a large chunk of glass broke free and fell into the door. You can be sure I won’t be baking baguettes any time soon. . . or anything else, for that matter. So, oven shopping this week or lots of spaghetti? I’ve used that method in even a HOTTER oven, with no ill effects. (Three different ovens, one in Europe). I’m guessing your oven’s glass wasn’t tempered enough. Oh my gosh! This totally beats the flaming diaper story! I’m guessing we won’t be having your yummy scones on Sunday night. Bummer all around! Oh, you poor thing! What a crazy thing to happen right before company! Well, I am really enjoying how you are spreading your wings culinarily (is that a word?) and it will be fun to hear how you improvise the next little while. Oh My Goodness!! Was it ice cold water? I have never heard of this before! I am assuming this means a new oven? Did the bread turn out the way you anticipated? LM – I’m pretty sure we’ll be having spaghetti. . . but no spaghetti pie, since that has to be baked! RG – That’s reassuring to know (and will make my husband much happier with me). I didn’t really think that what I did should have cracked the glass. BJ – I’m not sure. Now if I had actually put the chocolate filled diaper into my oven. . . that would take the cake. MEH – Yea, it kind of stunk to have to rush around and come up with an alternate plan. I’ll be sure to keep you updated on the kitchen improv. Tendrils. Don’t ya just love that word? Sorry ’bout your oven!! It’s almost poetic, though, with the party in the other room. My first thought was: “Oooh! At least I wouldn’t have to clean it!” 🙂 Sad and telling. Oh, how very sad – bad enough to have a rotten consequence when you are doing something wrong – oh so much worse when you were trying so hard to do something wonderful and right! WOW, didn’t know that was even possible. Now I have been victim to the cold water in a freshly washed (read: hot) glass exploding at a restaurant table (great way to get a free meal, btw). Sorry your oven found an untimely end. So you get a new oven eventually:) I hope your budget lets you get a convection I love useing mine. It saves so much time and energy. I am so sorry for your loss though. C – It is a nice, descriptive word, isn’t it. Unless they are growing in your front lawn? T – *lol* your comment cracked me up! S – It was a big bummer. But thankfully it’s now fixed. K – Yes, I guess it is. But the good news it has been resurrected! Excuse me if I was able to leave a post earlier. I don’t see it if it made it. I am making a video to post on my website and blog about steaming bread in a home oven and want to use the picture in the posting. It will be a free advise kind of thing, but will refernce a DVD I’ll be selling soon called Ciabatta at Home. The picture could be used in that DVD too. I’d like to send you that title when it is published and or one other title from my website by way of saying thanks. I don’t sell a lot of these, it’s more of a hobby than anything else. Please let me know your thoughts. It’s a good picture of an unfortunate event and I’d like to tell others what could happen and how to maybe prevent it. 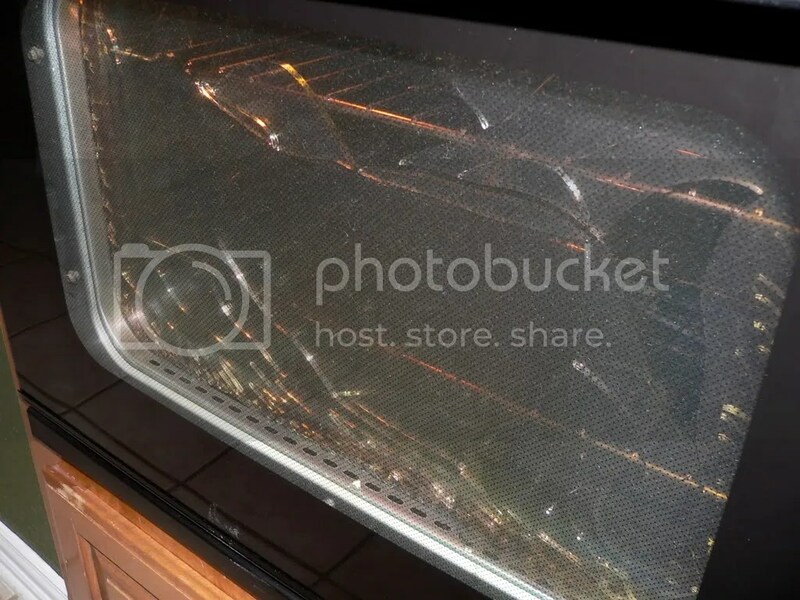 Right around the part where I describe the risks to the oven glass I’d like to display your picture. I’ll credit your blog if you like! I remixed the video and included the picture, thanks so much for letting our users see it and come to your blog.